If the lack of RGB lighting turned you off trying HyperX in the past, it’s robust enough in its manifestation here to be worth more than just a passing glance. At this stage, HyperX pretty much have all the fundamentals of the gaming peripheral product experience nailed down. When it comes to the nuts and bolts of mechanical keyboards, the company’s Alloy FPS is a high-value, high-performance contender. Same goes for headsets. Last year’s Cloud Alpha was so good that we named it our pick for best gaming headset in our 2017 Editors’ Choice Awards. Last year also saw the company move into mice with the FPS Pulsefire gaming mouse. Now, HyperX are moving beyond the basics. Like the heavyweights of the gaming accessories space before them, they’re moving towards RGB customizability. 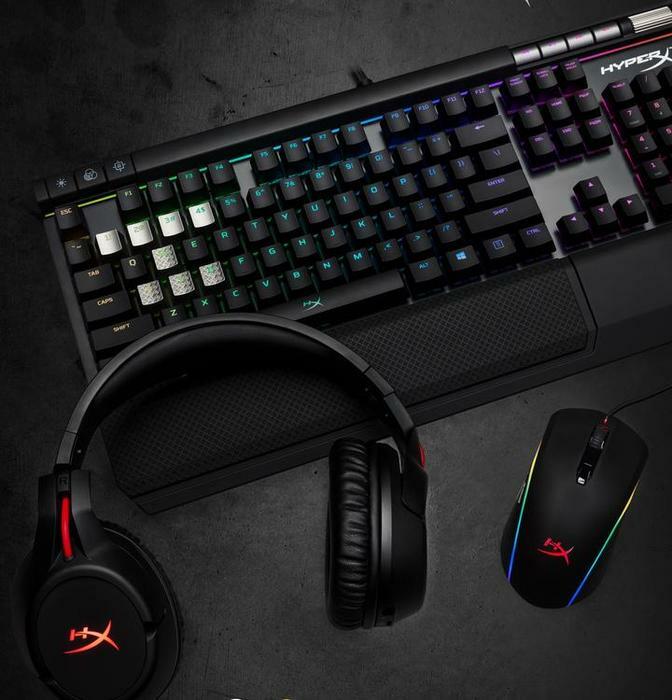 Their first efforts towards this, the HyperX Elite RGB keyboard and Pulsefire Surge gaming mouse, don’t get everything perfect - but they do a go a long way towards closing the gap between them and the established brands already playing in that space. In terms of the overall design and form-factor, the Pulsefire Surge mouse and Elite RGB keyboard are essentially a light refresh of last year’s products. Like their predecessors, they feel solid and ergonomically robust in a way that’s super appealing pretty much from the moment you take 'em out of the cardboard and plug them into your PC. The Cherry MX key-switches on the Elite RGB hold up as super tactile and while the Pulsefire doesn’t quite have the texture and grit of something like Razer’s Deathadder, it definitely feels more than responsive enough to ensure you'll have a decent time with it. That said, there is one key difference here: fully customizable lighting. In the past, HyperX have more-or-less only offered up the brand’s particular shade of crimson when it comes to LED under-lighting. However, with the Pulsefire Surge mouse and Elite RGB, the company are embracing the whole spectrum of colors via their free NGenuity software kit. Once installed, you can jump right in and customize the per-key RGB under-light on the Alloy RGB keyboard and Pulsefire Surge without too much trouble. You can set the speed, effect and direction you want the colors to change. You can also build custom macros for both HyperX’s mouse and keyboard, and when it comes to the former you can even mess with DPI settings via the software as well. It's all pretty standard - but it's not unwelcome. Like a lot of the competition, you can set specific profiles for specific games, with the Alloy RGB keyboard arriving out of the box with a couple dozens presets for popular online games like Overwatch, PlayerUnknown’s BattleGrounds and Counter-Strike: Global Offensive. Overall, this library is a little limited compared to the exhaustive integration available for Razer’s Chroma lighting products but it does tick the most popular boxes. As for how these profiles and customization actually look, we’d say we were pretty impressed with the under-lit keys on the Alloy but a little underwhelmed by the 360-degree wraparound LED on the Surge. Your mileage may vary here but the former struck us as a particularly vivid lightshow while the latter came across as a bit more of a gimmick when bundled alongside the somewhat-ordinary ergonomics of the Pulsefire mouse - which feels good but, at least in our experience, didn’t quite match the ergonomics, feel-factor and precision of our regular Razer gaming mouse. It's definitely the weaker of the two products. In terms of how it compares to the other RGB software suites available, it feels fair to say that Ngenuity offers a level of quick customizability that is easily-comparable to - but maybe not quite as polished as - its competition. That said, at times, the way that HyperX’s software lays out certain things seems unnecessarily convoluted and overtly utilitarian. It feels like a first attempt - and while it reaches in the right directions, it’s definitely clear that some learning still has to be done before it is on the same level as Razer's Chroma or ROG's Aurasync. Given that the only real, tangible difference between the new Pulsefire Surge mouse and Elite RGB and their 2017 counterparts is the addition of fully-customizable RGB lighting, your mileage will vary as to whether the accessories are worth the upgrade based on how much that matters to you. If you just bought into the HyperX family last year and customizable LED lighting seems a bit superficial, it’s probably worth sticking with what you already have. However, if the lack of RGB lighting turned you off trying the brand in the past, it’s robust enough in its manifestation here to be worth more than just a passing glance.